Civil wars, acts of terror, seizures of private industries-the world is a dangerous place for investors. Indeed, it is more dangerous today than ten or twenty years ago, because of the growing importance of emerging and frontier markets. Even many relatively passive or risk averse investors are exposed in places like Turkey, China, and Brazil. But while they recognize the importance of political risks, until now they have not the right tools to analyze, evaluate, and predict them. This groundbreaking book is the first to both identify the wide range of political risks that global firms face and show investors how to effectively manage them. Written by two of the world's leading figures in political risk management, it explains that while the world remains exceedingly risky for businesses, it is by no means incomprehensible. Political risk is unpredictable, but it is easier to analyze and manage than most people think. Applying the lessons of world history, Bremmer and Keat survey a vast range of contemporary risky situations, from stable markets like the United States or Japan, where politically driven regulation can still dramatically effect business, to more precarious regions like Iran, China, Russia, Turkey, Mexico, and Brazil, where private property is less secure and energy politics sparks constant volatility. The book sheds light on a wide array of political risks-risks that stem from great power rivalries, terrorist groups, government takeover of private property, weak leaders and internal strife, and even the "black swans" that defy prediction. But more importantly, the authors provide a wealth of unique methods, tools, and concepts to help corporations, money managers, and policy makers understand political risk, showing when and how political risk analysis works-and when it does not. Authored by Ian Bremmer (author of the bestselling The J-Curve) and Preston Keat, the president and research director (respectively) of Eurasia Group, the world's largest political risk consultancy, Machiavelli and the Markets is an indispensable guide for anyone involved in the international economy, from major multinational corporations to small businesses simply trying to understand the risks that come with exports and imports. 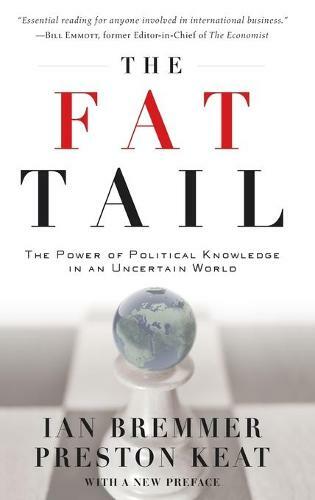 Political risk has become increasingly complex, and 'The Fat Tail' provides a truly new way to quantitatively assess it in established and emerging markets. It is essential reading for any CEO with multi-national interests. Advance Praise from Randall Stephenson, Chairman, CEO and President, AT&T Inc.